Students Groups must be carried out by a tour leader. Meetingpoint bevindt zich te midden van prachtige tuinen in het centrum van Madrid, tegenover de kathedraal van Almudena en het Koninklijk Paleis. De accommodatie heeft kamers met gratis WiFi. De receptie van Meetingpoint is 24 uur per dag geopend. Er is een rustgevende lounge met een bank en een televisie. De accommodatie beschikt over een wasruimte met wasmachines en drogers, en een gedeelde keuken. Meetingpoint heeft privékamers en slaapzalen en gedeelde badkamers met douches. Sommige kamers hebben een eigen badkamer. Er zijn gemengde slaapzalen en slaapzalen voor alleen vrouwen. I loved!!. Is a really good hostel. Great location, the Staff is really friendly. The beds are really comfortable, bathrooms are super clean. You can relax and be chill at the comun area. At the kitchen you have everything to cook. Also next to the hostel you have the best view to see the sunset in Madrid (better than at the Temple) :).. 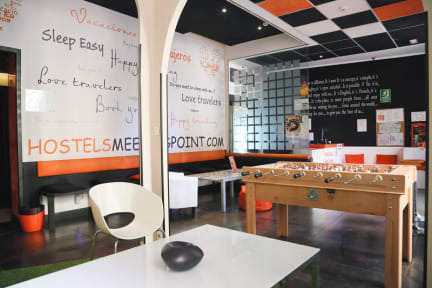 Thanks Carlos, Rafa and all the Meeting Point Hostel Team!!. 100% recommended!!. Kan niets slechts over mijn verblijf zeggen. Vriendelijk personeel, aangename kamer en zeer goed gelegen! This hostel is at a good location! Everywhere you're nearby. Beautiful! The staff were friendly and some of them speak English (but sadly not everybody). The beds were clean and the bedsheets smelled fresh. I was really happy about that. Unfortunately, the floor wasn't really proper. They should clean the rooms more often. They should also take a look at the showers. It takes a long time till they get hot. It's not really bad, just wait for 10 minutes and then you have a good shower. Not a cozy hostel by any means. It's basically a place to sleep and nothing more. Don't go here if you are a solo Traveller and want to meet other people. The hostel was clean and modern. Showers were either piping hot or freezing cold. We couldn't find any sharp knives in the kitchen, kind of annoying when you want to prepare your own food. 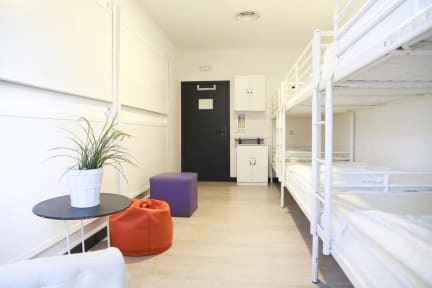 Staff was unfriendly and were not all able to speak English... we cancelled a bed three weeks in advance by email but had to pay the full amount in the end because we did not cancel through hostelword. Extremely traveller unfriendly since we didn't have this problem when canceling beds in others hostels. Was supposed to stay 10 nights, but left after 5 nights because I felt very unsafe & unhappy in the hostel. Someone broke into the lockers in the dorm twice, but nothing was done to fix the broken lockers so there just were two less. The atmosphere in the hostel is not good, with some of the staff being extremely rude towards me. Beds make a lot of noise and have very thin matresses. Kitchen is in the basement and feels that way too (closed after 10). Showers are shut down at an early time.